Summer is quickly coming to an end (even though the temperatures would fool you!) 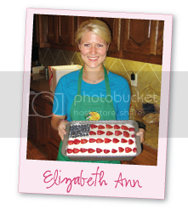 and I am trying to make as many fruit salads, smoothies, and desserts with fresh fruit as I can before stocking my freezer with frozen fruit! This salad is light and delightful! :-) The perfect mid-day snack or a lovely side salad to compliment a summer meal! Cut watermelon and place in bowl. In a small bowl, whisk vinegar, oil, 1/4 teaspoon salt, and 1/4 teaspoon freshly ground black pepper; drizzle over watermelon salad. Add blue cheese and toss very gently to coat. To serve, divide among 12 large paper cups or small bowls, or decoratively arrange on large serving platter. Yum! 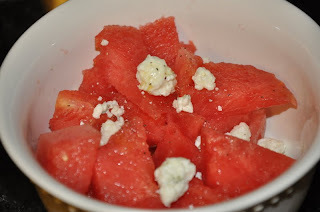 I love watermelon and I love blue cheese - so this is perfect!